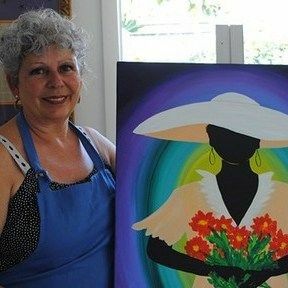 Welcome to Samantha Claar's Gullah Living - In 2008 I became acquainted with Gullah-Geechee people from the past. They visited and demanded that I paint what they were showing me. They told stories that were meant to be given life on canvas. My wife and I had the pleasure of visiting Savannah from Birmingham, and meeting you at a gallery on the riverfront in mid May 2016. You caught us admiring your work and shared with us some history of the Gullah people. From that moment we both sporadically mentioned how much we really enjoyed your art. After speaking about it so much, we found your website and chose two pieces for our home. We have been married for seven years and are both 31 years old, and this is the first art that we have purchased from a known artist. Thank you very much for talking a few moments out of your day to speak with us, sharing a glimpse Savannah's history, and exposing us to your beautiful artwork of the Gullah people. We really do appreciate the chance to get to meet you and to show our family and friends your beautiful work. I exhibit two original paintings a month plus a small selection of prints and cards. Every February the ALHH gallery (see above) is rented out and features only Gullah themed work. This is a great opportunity to see work from a variety of Gullah artists from several States. In JULY 2018 I will be doing a month long show of 20 originals and a full complement of prints. Renee and Robert, the proprietors stock all aspects of my work. ORIGINALS, GICLEES, PRINTS, CARDS, DOLLS, WEE PEOPLE AND THE GULLAH LANGUAGE ‘NEW TESTAMENT as well as selected books on the Gullah Geechee culture. They also host an aspiring artist each month as part of their commitment to the arts. They are now Savannahians via New York, so visit often.